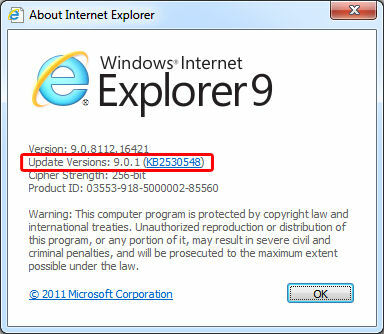 Ya está disponible para todos los que usamos Internet Explorer 9 la actualización de seguridad de junio que da carpetazo a 7 vulnerabilidades serias del navegador de Microsoft. Esta actualización también afectara a las versiones más antiguas del explorador. Internet Explorer se actualizará automáticamente siempre que tengas Windows Update activado. A partir de este momento la versión del navegador cambiará a Internet Epxlorer 9.0.1 así que si no tenéis esta versión en los detalles, bajadla cuento antes ya que impedirá que ciertas webs puedan ejecutar programas simplemente con visitarlas. I like your idea, we were so attractive, creative material is a very fashionable idea! We all want to stay here and play, there would be no regrets, excellent blog on your side. I’ve been writing essays for how many years and today I’m more on academic essay writing and I’m happy to be like my dad, a professional writer. Great To Read. Good Job, Keep Posting. your imaginative thinking and impressive stated information impressed me. i am pleased. UGG Boots Clearance has spread to the rest of the world, and gave the impression that these beautiful boots are both comfortable and warm. Wide variety of styles and novelty incomparable. Wearing warm Discount UGG Boots will bring you a good mood every day. Then make the winter full of fun and warm. It was really very nice concep,t i definitely share your views to my close friends keeps up the good work going. A lot of these plastic bags can be husky farther request profit engreimiento day shelter to all your desktops. I am come a cross to your site and found it according to my need and demand. I would very much like to hear more from you on this subject. You certainly know how to keep a reader entertained. Well...undoubtedly, great work done by blogger. Good points are covered, but it would be a cherry on pie if you can just share the things elaborately.